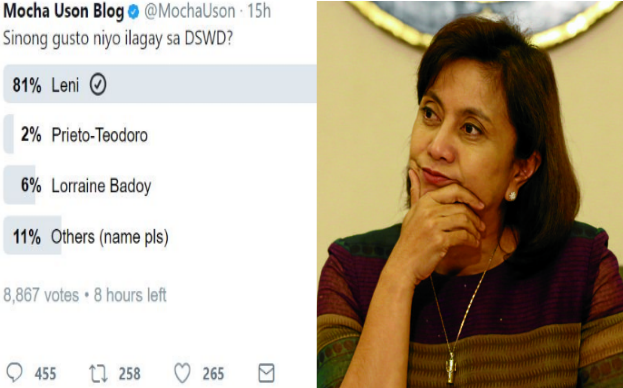 Vice President Leni Robredo is leading by a mile in the Twitter poll created by Communications Assistant Secretary Mocha Uson on who should replace former Social Welfare Secretary Judy Taguiwalo, whose appointment was rejected by the Commission on Appointments (CA). Initial results of the poll showed Robredo is preferred by 8 out of the 10 of netizens. Six percent want Social Welfare Assistant Secretary Lorraine marie Badoy, while two percent want former congresswoman Nikki Prieto-Teodoro to head the Department of Social Welfare and Development. 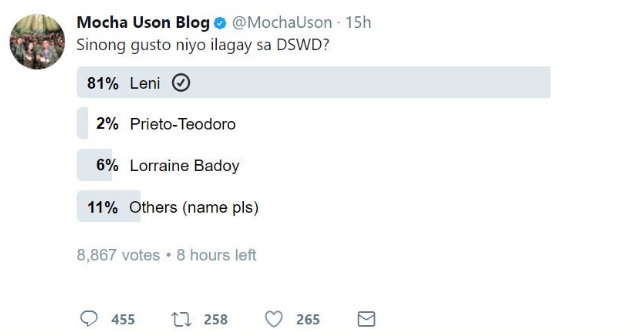 Netizens have until 8 p.m. tonight to vote on Uson's Twitter poll. Leni over Lorraine? I am shocked.